NASA meteor-camera image of a "meteor" streaking through the skies over North Carolina on June 29, 2015. The event was likely caused by a piece of re-entering space debris, experts say. The bright light that streaked across skies throughout the American Southeast early Monday morning (June 29) was probably a piece of space junk crashing back to Earth, researchers say. 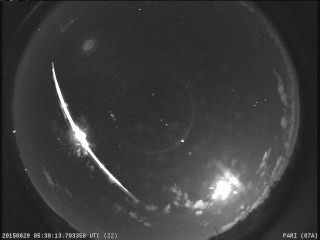 The mysterious sky light blazed up at 1:29 a.m. EDT (0529 GMT) Monday and was witnessed by skywatchers from Louisiana to Virginia — and by all six meteor-observing cameras operated by NASA in the Southeast. But this was no meteor, said Bill Cooke, head of the Meteoroid Environment Office at NASA's Marshall Space Flight Center in Huntsville, Alabama. "It moved too slowly," Cooke said in a video released by NASA on Monday. "This thing hit the atmosphere moving between 14,000 and 16,000 mph [22,500 to 25,750 km/h], and while that sounds fast, meteors move at 24,000 mph [39,000 km/h] or faster." In addition, video captured by the NASA cameras reveals that the object that generated Monday morning's "shooting star" hit Earth's atmosphere at a very shallow angle, which also isn't typical for a meteor, Cooke added. "So, the speed combined with the shallow entry angle suggest that it was a re-entering piece of space debris, or something like that," Cooke said. The NASA cameras' footage also shows that the bright streak is actually four distinct objects moving across the sky. "This is typically what you see in a re-entry, where the object is breaking up, and as the pieces fall off, each one of them begins to burn up and become self-luminous," Cooke said. So it "looks like a re-entering object — something burning up in the atmosphere," he added. Indeed, Monday morning's event may have been caused by the re-entry of Russia's SL-6 Rocket Body, which was launched in 1992 as part of the Cosmos 2196 Missile Early Warning system, Vincent Perlerin of the American Meteor Society wrote today (June 30). Researchers are currently tracking more than 22,000 pieces of debris at least 4 inches (10 centimeters) wide in Earth orbit, and millions more that are too small to spot with current technology are probably zipping around the planet.